Rya Duncklee is an award-winning children’s portrait artist based in Jacksonville, Florida who specializes in first year milestones and video storytelling. 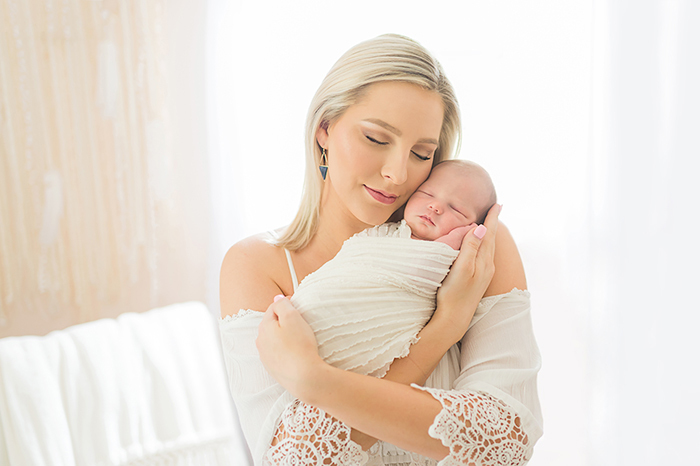 She has been recently awarded as one of the Top 20 Newborn Portrait Artists in Jacksonville, and has been the recipient of ten NAPCP International Image Competition Awards. Rya graduated from the University of Florida where she earned a double degree in advertising and marketing, with a special concentration in international business. Until 2011, she worked at an advertising and publishing agency as a copyrighter and art director before pursuing her love for photography full-time. Rya is a proud member of the National Association of Professional Child Photographers (NAPCP) and is the interviewer for the NAPCP Video Interview Series. She is also an accredited member of the Professional Photographer’s Association (PPA). When Rya’s not documenting moments in time for families, she enjoys traveling, cooking and DIY projects with her husband in their new home. For more from Rya, and for booking inquiries, please visit Rya’s website, Like her Facebook page, and Follow her on Instagram. My inspiration for this portrait session was definitely the nursery itself. Mom wanted a very boho style to her portraits, so I was sure to incorporate lots of whites and light into each photograph. 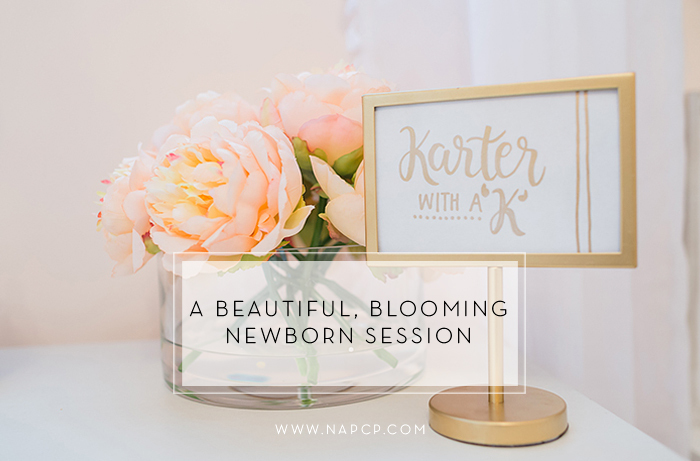 We made sure to utilize a few of the items from the nursery into the session to give it an even more personal touch, like the adorable little floral crown. 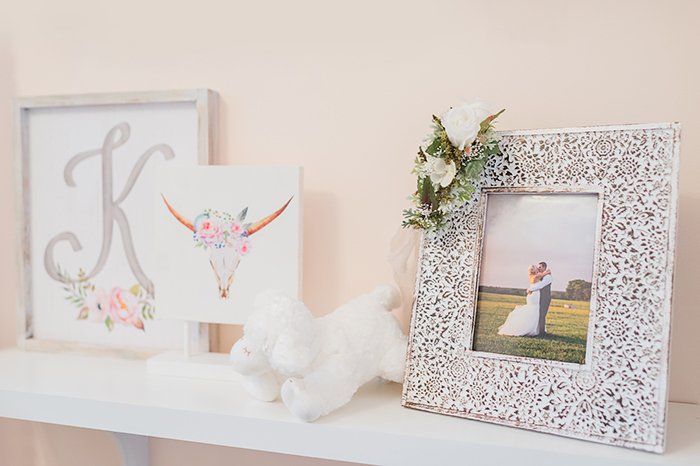 You will notice the printed b+w framed portraits adorning the back walls of the space – these are prints from her maternity session from the month before! I love it when clients value the end result, and make the investment to print their portraits. This added to the inspiration. The lighting as well as the temporary space this client currently calls home were the two biggest challenges for this portrait session. To add to that, it was a very rainy day so it continued to get darker as time went on. The saving grace was when I opened the door to the nursery and was astonished about how beautifully-decorated, and how beautifully lit, the room was. Upon seeing this, I made the decision to shoot the entire session in this small space. Mom’s touch. I personally am in love with anything white, organic and boho, so when mom communicated to me her vision for her nursery, I knew I was in for a treat. I loved all of the little personal touches mom made throughout the space. I also loved how she incorporated printed portraits of the family throughout. 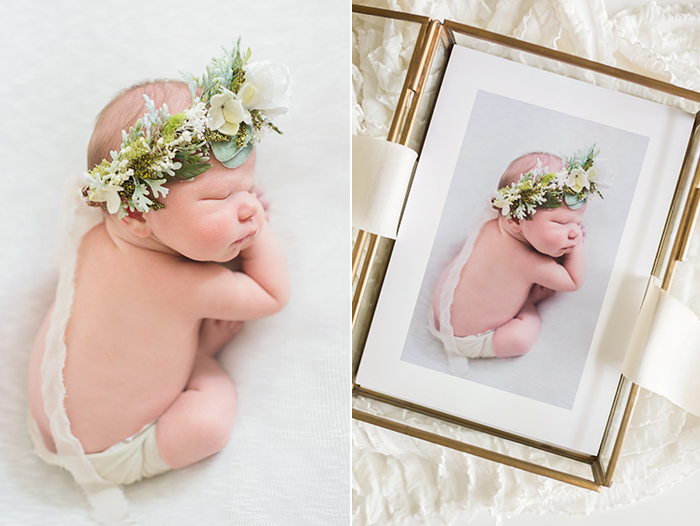 When this lucky little lady grows up, she will feel so loved surrounded in memories! One of the best things about custom portraiture is being able to walk away with something tangible, something to hold on to that fleeting memory. A photograph is a way to freeze a moment in time otherwise lost. Take this idea home by printing your work, even if with your local lab. Get those images off of your device and enjoy them!